The streetcars that plied Oregon’s small-town streets were every bit as diverse as those in Portland and their history even more fascinating. Learn of the devastating 1922 fire that scorched Astoria’s plank road railways and put a halt to its once-thriving streetcar network. Muse over the tale of a beloved white horse named Old Charlie that proved more efficient at powering Albany’s streetcars than the alternative steam locomotive. Laugh at the spectacle of university students being carted back to their dormitories on the Eleventh Street Line’s special midnight “drunk express” trains. Take pride in the tiny town of Cherry Grove, which became the first in the West to embrace new battery technology. 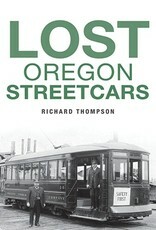 Local historian Richard Thompson celebrates the lost trolley lines that transported Oregon’s people across the state for decades.